← Yay, I Did It! This past weekend Bill and I went up to the Arena Stage in Washington, DC to see a show. Every year we buy a half series of season matinée tickets, jump in the car and make the two and a half hour trip up and back in one day. It’s a great way to get out of Dodge for a short period of time, cleansing the mind of huge and trivial pursuits, and giving us a taste of city sophistication. Though Charlottesville is a pretty sophisticated place it doesn’t hold a candle to being in the capital, where like it or not, it all happens, good, bad and indifferent. This past year has been a fairly good season for us in which we saw, Pullman Porter Blues (great music, so-so otherwise), Metamorphosis, and Good People, both stellar in almost every way. Should you want to know more about them go to Bill’s blog, at View In The Dark, for his reviews and his interesting theatre chatter. 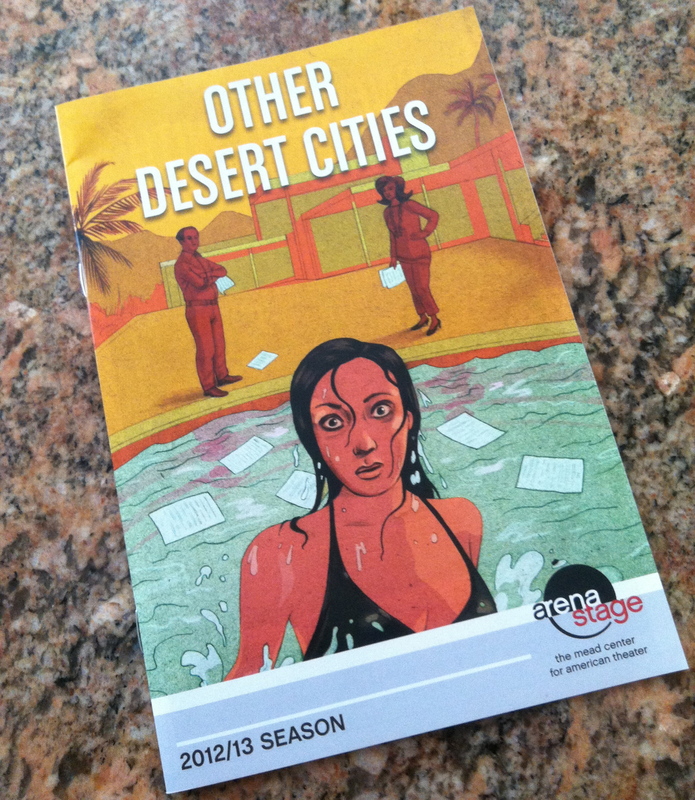 But in my mind, the best this year is the last of our series, Other Desert Cities, by Jon Robin Baitz, who created Brothers & Sisters for ABC. And if truth were told I wouldn’t mind seeing it again and often, and I think I’ll even read it. A very rare thing for me. Set in the living room of the well-connected Wyeth family, who live in the desert community of Palm Springs, this family drama caught my attention for it’s references to writing memoir and truth. Something many of us who are involved in the genre of memoir deal with every day as we put pen to paper. In this theatrical production, daughter, Brooke, comes home for the holidays for the first time in six years. She brings with her the manuscript of a book she has just sold and will soon be on bookstore shelves. Intended to be a novel, her story turns into a memoir during the writing process, as she deals with the suicide of her brother, with whom she was very close. Her parents, old friends of Nancy and Ronald Reagan, and the darlings of Republican politicians, far and wide, plead with her to wait to publish the book until after their deaths, claiming the consequences would damage too many lives. I won’t go any further in telling the story and the secret that eventually comes out, as I hope all of my memoir writing friends and everyone else for that matter, will go out and see this heart-wrenching drama when you have a chance. It was nominated for a Pulitzer Prize for Drama in 2012, and will hopefully continue to make its rounds in regional theatres across the country. This entry was posted in family, Friendships, Memoir, Navigating Through Life, Quotes, Theatre and tagged Consequences, DC, Family Drama, loss, Moving Forward, The Arena Stage, Truth, Washington. Bookmark the permalink. Sounds like a great play for memoirists, Joan. I’d love to see it. Always appreciate when others like you and Bill warm up the seats and tell me which ones I can miss and which ones I can’t. I trust your judgment. I think you’d like this one, Shirley. Don’t know how much longer it’s running, but it’s very much worth the trek. Joan, I had never heard of this play but it sounds like a very interesting one, especially for memoir writers. Thanks for letting us know about it. You’re so welcome, Kathy. I hope you get a chance to see it sometime. If you do let me know what you think. This sounds like a really interesting drama. I’m always on the lookout for good plays to suggest to my friend who is the artistic director of a small community theater. She loves bring new things to the stage. Have you ever seen a play called August, Osage County? She’s been raving about that one, but tells me it’s heart wrenching.